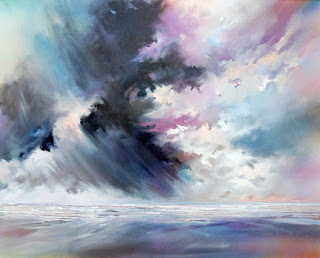 TERRY KOBUS - ORIGINALS GALLERY: "Early Rains - Grotto Beach Hermanus"
"Early Rains - Grotto Beach Hermanus"
This large painting, completed in my studio/gallery during the Whale Festival in October 2011, captures a distant storm over Walker Bay towards Gansbaai. The dramatic clouds and sheets of rain dominate the composition while light and colour play across the skyscape. The wet beach reflects the dramatic sky above.